Have you ever wanted to collaborate with a famous artist? 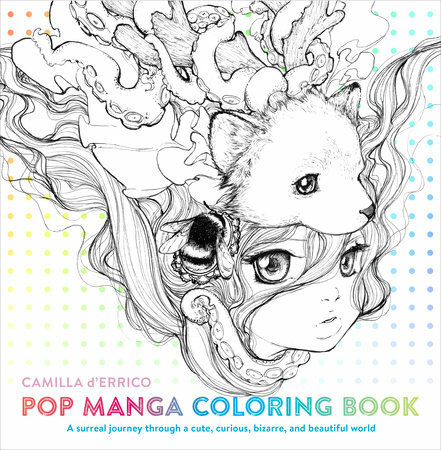 Pop Manga, Camilla d’Errico’s New Coloring Book gives readers the opportunity to do that, surrounded by the artists awesome world. Camilla draws heavily on pop and manga/anime influences, creating a world that can only come out of the imagination. While I don’t consider myself an anime fan, d’Errico’s take on the genre helps me get closer to the point where I could be a fan of the genre. Camilla’s flowy lines create an interest in the mix of mechanical, nature and human within the book. The pages are thick enough to color on in your favorite medium (I recommend putting a paper towel under the page while it dries). I love the eyes, eyes are the hardest to design, and the eyes of the creations within Manga Pop make me full on fangirl squee. I was able to use my pencils to softly trace my pencil around the eyes in the hopes that I can get the muscle memory to draw my own take on the eyes of the characters. I recommend Prismacolor colored pencils and the blender to achieve a really vibrant look, but I cannot speak for other brands of colored pencils. I do like, however, the idea of using a few mixed media like Camilla may use in her own work. In fact, some of the designs in this book are complimentary/similar to those found in the Pop Art painting book by Camilla d’Errico. I had a lot of fun with that book, so this coloring book makes a natural partner on the artsy part of my bookshelf. 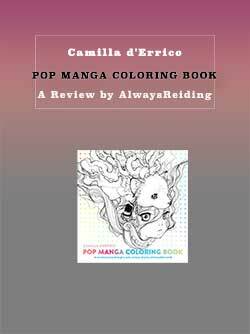 Special thanks to Blogging for Books for allowing me a copy of the coloring book in exchange for my honest review. I cannot wait to see more of what Camilla d’Errico publishes.